Either way, Ayano will end up in doujinshi! 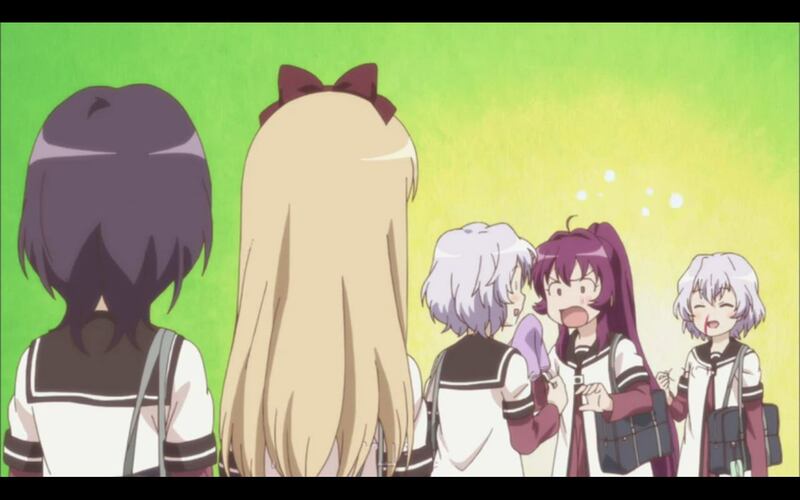 Chitose and Chizuru – what a sister combo! It’s just f’ing awesome that Chitose and Chizuru both fantasizes like crazy. And I feel like Ayano, spinning round and round trying to wipe their bodily fluids off their faces! Wow! That imagery was so wrong! But that’s part of what I like about this show, cheesy and not afraid to be cheesy, and never forgets not to take itself serious at any moment. Most important of all, it’s (bad but good) chicken soup for the Otaku soul! It simply caters to me and others like me and it throws reasons out of window, and does it with energy and vibrancy, how can I not love it? All the yuriness leaking and dripping from all corners of the screen and yet not obnoxious or overtly sexual, it’s the perfect summer show for me to chill out, I say, “why not”? And episode 8 is actually pretty funny. GREAT! Watch it here at Crunchyroll.